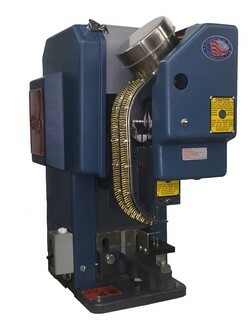 Edward Segal Inc. manufactures custom eyelet machines to automatically feed and set up to 4 eyelets simultaneously, depending on center distances of the eyelets, using our Model 83 Eyelet Machine platform. This can also be done with the 2R83 and 83LR Eyelet Machine platforms as well. For added versatility, a dual-head configuration can be used for applications where eyelet center distances change. Please contact Edward Segal Inc. for more information on this product and how we can increase your efficiency.